Kanye West performed on the season premiere of Saturday Night Live on Sept. 30, 2018. Don't let the new name fool you. 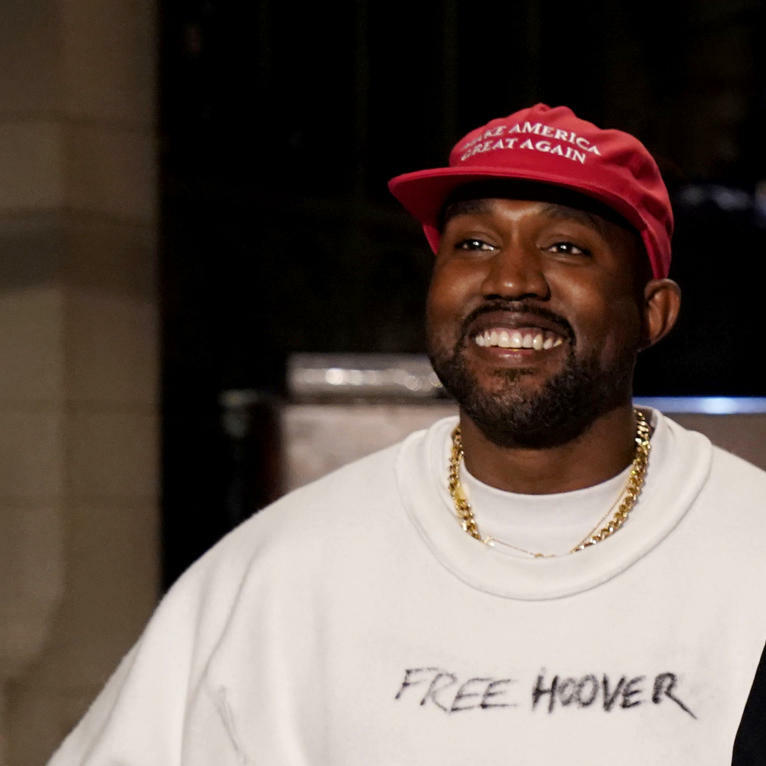 Kanye West may have announced a name change to Ye this week, but he was up to his old shenanigans as the musical guest on the season premiere of Saturday Night Live. True to form, he closed the show with a MAGA-inspired monologue defending President Trump. It was a symbolic cap to the political spectacle of the past week: Another man in a position of privilege felt threatened enough to unleash a rant over his perceived freedoms under attack. "They bullied me backstage, they said don't go out there with that hat on," Ye said. His rant came at the close of the show, as West was joined onstage for a final performance, with collaborators Kid Cudi and 070 Shake, of "Ghost Town" from his 2018 solo album ye. With the credits rolling and some cast members visibly shaking their heads in disagreement, Ye continued as the show cut off. Video footage recorded by audience members, including Chris Rock who can be heard laughing in the background, made it to Instagram. It's the only performance of Ye's three on Saturday's show that NBC hasn't uploaded to its SNL YouTube account. "This means you can't tell me what to do," Ye continued, tugging on the brim of his hat. "Follow your heart and stop following your mind. That's how we're controlled; that's how we're programmed." He espoused love as the answer before thanking SNL for the platform. "I know some of y'all don't agree, but y'all be going at that man neck a lot and I don't think it's actually that helpful." The man in question, of course, was President Trump, who got a rare reprieve from SNL's cast on the season opener in favor of Brett Kavanaugh. Trump's Supreme Court Justice nominee got raked over the coals in a portrayal by actor Matt Damon during a spoof of the emotional Senate Judicial Committee hearing over Kavanaugh's sexual assault allegations. It's hard to imagine Ye even being cognizant of what was happening in the world last week, as he prepared for his SNL performance and the release of Yandhi, his second solo LP of 2018. The album still has yet to appear on streaming sites, but SNL viewers may have gotten a tease with the debut performance of a new song titled "We Got Love," featuring Teyana Taylor. It was the second of three performances during the show, the first being a juvenile rendition of Ye's recent hit "I Love It," featuring he and rapper Lil Pump dressed respectively in full-body costumes of Perrier and Fiji water bottles. Kanye's SNL rant was not the only news he made in last week's rollout for the recently-announced LP, that has more people buzzing about his controversial statements than the music. During a stop at the New York office of music magazine The Fader, he reportedly referred to Trump and Alex Jones, founder of the right-wing conspiracy theory site, as "matrix-breakers." (That quote, initially reported in The Fader's recap of his visit, was deleted later, leaving outlets like Spin to speculate on the reasons why.) He also espoused his love of alt-right personality Candace Owens, and claimed admitted sexual assault perpetrator Louis C.K. was his preference for SNL's season premiere hosting duties. His attire during that visit was equally problematic. He wore a Colin Kaepernick sweatshirt and a MAGA hat that he claimed to have "put positive energy into," with a redesign that failed to alter the message. Kaepernick has faced some of his harshest criticism from Trump, making Ye's outfit an outward display of cognitive dissonance if ever there were one. In line with his embrace of questionable figures, Ye also came to the defense of fashion designer A$AP Bari, of hip-hop collective A$AP Mob, who also faces sexual assault allegations, and deceased artist XXXTentacion, whose short career was defined by allegations of physical and sexual abuse against a former girlfriend. The only thing missing from Kanye's rollout was an endorsement of Kavanaugh. Considering his recent streak of aligning himself with divisive figures, it would've been totally on-brand.